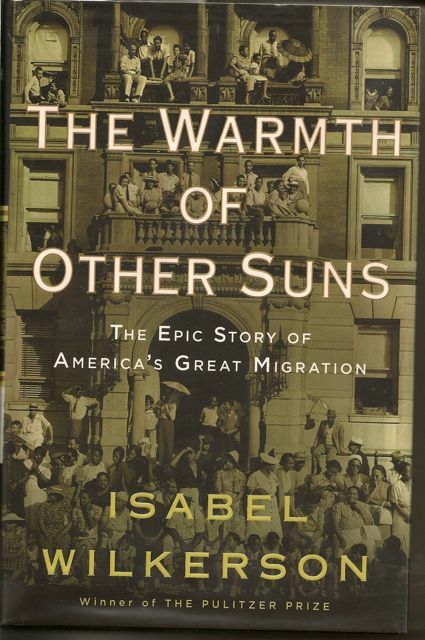 Isabel Wilkerson’s book, The Warmth of Other Suns – the epic story of America’s great migration,1 creates whole new planes of awareness of our history. This book startled me to a new understanding of how encompassing and pervasive the Jim Crow laws and social rules of the South really were. Without much thinking on my part, I have always equated Jim Crow with images of separate water fountains, lunch counters, and schools, along with denial of voting rights. Included were images of lynchings and mob violence. Wilkerson’s work brings to life the real depth of the American system of Apartheid. These laws and social rules were so extensive as to lead to separate break times in factories so that whites and blacks would not even use a stairway at the same time. This is the story of the six million African Americans who left the South for the North and West of the US between 1910 and WWII. Wilkerson builds her narrative of the main courses of this migration through the stories of three people leaving three different parts of the South, venturing to the three main destinations, NYC and the northeast, Chicago, and Los Angeles over three decades (teens through 40’s). Her overall research included interviews with over 1,200 people. The stories do not end with the escape from the South. Wilkerson follows the stories as they unfold in their new environs. Here the transition from the oppressions of the South to the new realities of the north and west. No surprise the escape from the South did not mean an instant escape from racism institutionalized or otherwise. This part of the story is more familiar to a Northern urbanite. This book, along with Douglas Blackmon’s Slavery By Another Name – the re-enslavement of Black Americans from the Civil War to WWII2 are compelling additions to understanding the history of racism in the US. Both are must reads.